For the novel by Liz Rosenberg, see Home Repair (novel). For other uses of "repair", see Maintenance, repair, and operations. Emergencies can happen at any time so I is important to know how to quickly and efficiently fix the problem. From natural disasters, power loss, appliance failure and no water, emergency repairs tend to be one of the most important repairs to be comfortable and confident with. In most cases, the repairs are DIY or fixable with whatever is around the house. 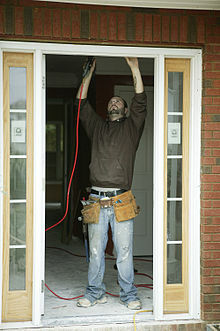 Common repairs would be fixing a leak, broken window, flooding, frozen pipes or clogged toilet. Each problem can have a relatively simple fix, a leaky roof and broken window can be patched, flood can be pumped out, pipes can be thawed and repaired and toilets can be unclogged with a chemical. For the most part, emergency repairs are not permanent. They are what you can do fast to stop the problem then have a professional come in to permanently fix it. Often on the bottom of people's to-do list is home maintenance chores, such as landscaping, window and gutter cleaning, power washing the siding and hard-scape, etc. However, these maintenance chores pay for themselves over time. Often, injury could occur when operating heavy machinery or when climbing on ladders or roofs around your home, so if an individual is not in the proper physical condition to accomplish these chores, then they should consult a professional. Lack of maintenance will cost more due to higher costs associated with repairs or replacements to be made later. It requires discipline and learning aptitude to repair and maintain the home in good condition, but it is a satisfying experience to perform even seemingly minor repairs. Water infiltration is one of the most insidious sources of home damage. Small leaks can lead to water stains, and rotting wood. Soft, rotten wood is an inviting target for termites and other wood-damaging insects. Left unattended, a small leak can lead to significant structural damage, necessitating the replacement of beams and framing. With a useful selection of tools, typical materials and supplies on hand, and some home repair information or experience, a home-owner or handyman should be able to carry out a large number of DIY home repairs and identify those that will need the specialized attention of others. ^ New Complete Do-it-Yourself Manual, an all Canadian guide. United States of America: Readers Digest. 1991. pp. 9–13. ISBN 0-88850-178-1.